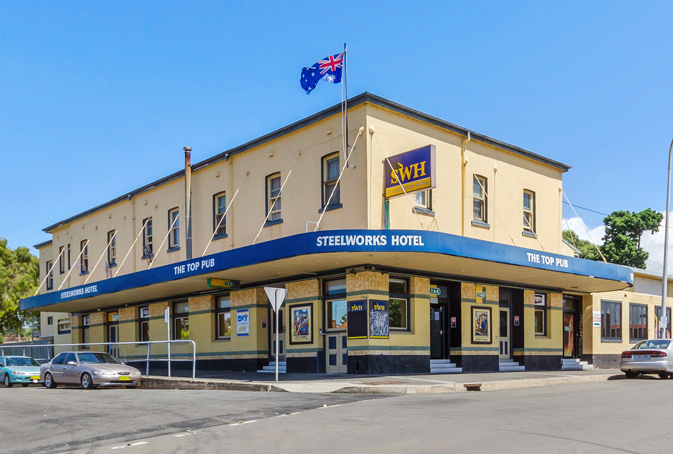 A partnership split has brought Port Kembla’s Steelworks Hotel back on the market, with a fresh refurb and definite upside. Last sold in November 2013, the 1912 hotel originally named the Great Eastern is described by Wollongong City Council heritage documents as “an imposing landmark of the area, dating back to the beginnings of the town as a port and industrial centre”. It was purchased by two Sydney brothers in 2009 for around $1.9 million, and sold when they parted ways in 2013 for around $2.1 million. The “Top Pub” is being marketed by Ray White Hotels’ Blake Edwards, who told PubTIC enquiries so far have already shown interest its consistent gaming revenue in 2014. It boasts 15 EGMs, with SIA allowing for another ten. “We’ve had a strong response from market, which is not surprising given the strong gaming performance. Buyers are attracted to gaming revenue because of its high potency. “I understand Port Kembla is going to turn it into a major freight terminal, which would undoubtedly benefit the Steelworks Hotel,” said Edwards. The renovation has seen a string of necessary repairs undertaken, and an upgrade to the 15 accommodation rooms.